Welcome to the classic game "Pacman". Pacman was formerly played by thousands of young people, hours and hours on end. The aim of the game is quite simple. You should see all the white dots on eating, but you should be careful that the color samples do not catch you. When they get your you lose a life. 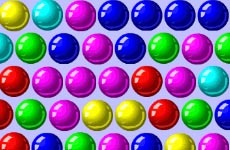 If you eat are a large white ball rolls temporarily reversed and are you able to eat the colorful monsters.